Madigan made…. 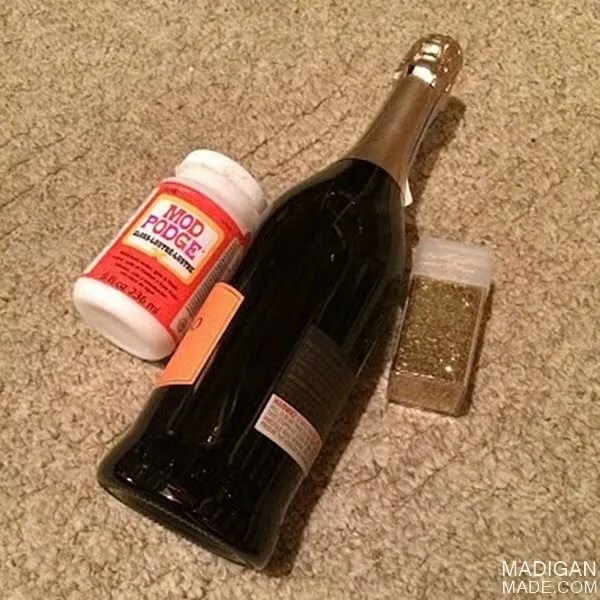 an easy way to “wrap” a champagne bottle. Everyone has their own ‘bucket list’, right? You know… that list of things you hope to do before you die. Well, someday I’d love to travel to Europe (I’d start in Italy, in case you were wondering.). Someday I’d love to author a craft book (It’s gonna happen. Wait.). But I also have a DIY ‘bucket list’…. a list of skills, crafts or mediums that I’ve always wanted to try (i.e. learn to knit, attempt to install wainscoting, etc.). 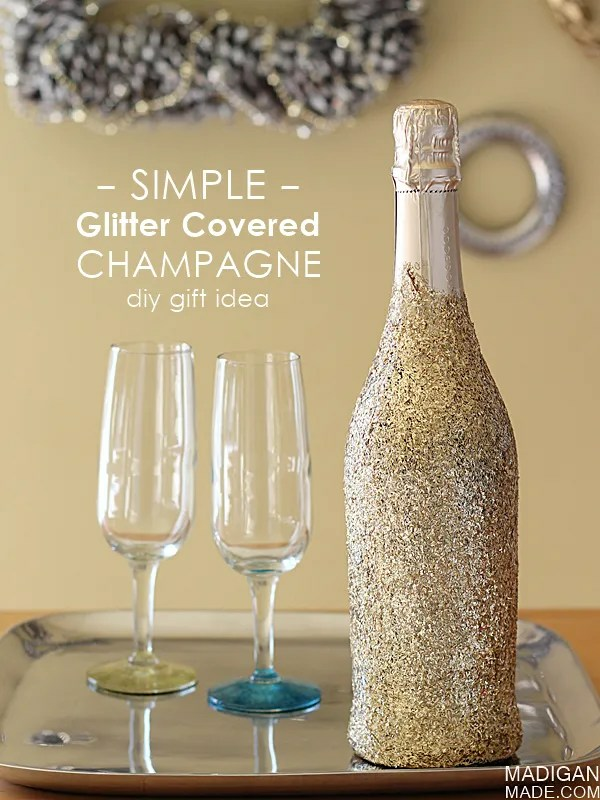 And some of my crafty aspirations are simple… like I’ve always wanted to cover a bottle of sparkling wine with glitter. What, that’s not on your list? I was inspired to make this sparkly craft this after seeing this confetti covered bottle from Brit + Co. I decided to use glitter instead of confetti. 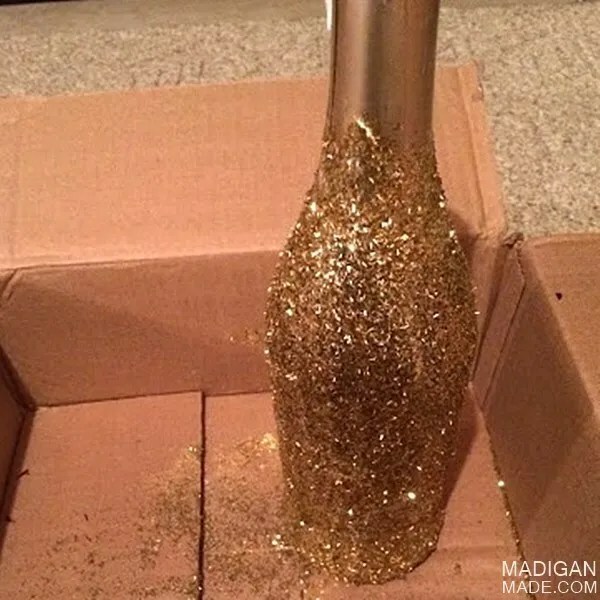 Who can resist a bottle covered in gold glitter? Not me! I think this would be a fun way to bring a bottle of wine or bubbly to your next holiday or New Year’s Eve party. Just add a bow or bring it as-is. Me? This bottle is staying at home for a special occasion in the coming months (my birthday!). How did I make it? The process was pretty simple. Let me show you. Grab a bottle of champagne. Using a brush, coat the lower part of the bottle in decoupage. Sprinkle liberally with glitter… whatever kind you like. I was partial to gold tinsel glitter that day. Once the decoupage is dry, brush on 2 more coats of the glue to fully seal and secure all that sparkle down. 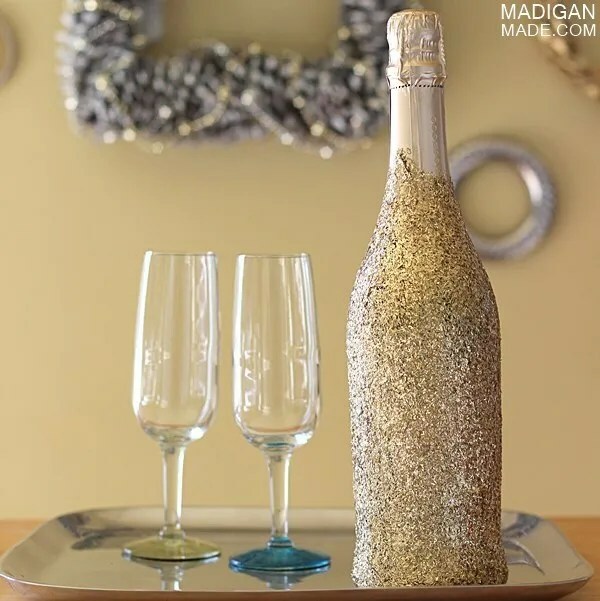 Allow the decoupage to dry and store the bottle until you are ready to give (or drink!). NOTE: Most decoupage is not water resistant. To chill this bottle down, I would NOT advise dunking it in ice water.The best way to chill the bubbly is probably to stick the bottle in the refrigerator for several hours. So. I am now the proud owner of a big sparkly bottle of champagne. (Can you see the goofy grin on my face?) I guess I can check THAT off my bucket list! What’s on your crafty bucket list? Are there any projects you’ve always wanted to attempt?